Father’s Day on June 17 is a day to honor the extraordinary dads in our lives. It is a time to recognize fathers’ involvement in families and how much they do every day. Dads are teachers and serve as role models for their children, and military dads in particular demonstrate the importance of serving our nation. Omni is proud to honor all the amazing military dads! Happy Father’s Day to all the military dads! 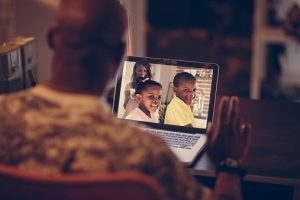 There are many meaningful ways you can celebrate Father’s Day and show your special dad just how awesome he is, even while he is abroad. Here are some ideas for staying connected with a deployed dad this Father’s Day and expressing your love and support for his dedication to you, your family and our country. Get the entire family together to create a themed Father’s Day care package. Just a quick search on Pinterest will pull up hundreds of great theme ideas for decorating the box. Or make up something completely unique to you and your family. From joke-theme packages to care packages for the Hulk or Star Wars fan, there are so many fun themes that are sure to make your soldier smile as soon as he opens the box. Once you decide on a care package theme, you can start filling the box with handmade cards, handwritten notes, photos, and other mementos that will remind him of how much he is loved. To help younger children share their thoughts, there are free printables that you or your child can fill in with his or her answers. Here is a link to a “My Daddy” Father’s Day printable. Of course no care package would be complete without some goodies. Add some of dad’s favorite packaged snacks and treats, personal care items and other things he might need or want. Involve the children at every point of the care package preparation process. It will help demonstrate that even though they may not be with dad right now, he is close at heart and a very important part of their lives. For tips on packing and mailing your care package, view this infographic for important dos and don’ts to keep in mind. There are many meaningful ways you can celebrate Father’s Day and show your special dad just how awesome he is, even while he is abroad. Plan a Father’s Day family get together using Facetime, Skype or other video chat technology. Even though you are not all physically together, video chatting can help you feel like you are close by. It’s a wonderful way to connect. Have your children read special Father’s Day messages, sing songs, or share a recent school project. If you are sending a care package, consider including a toy in the care package that is like the ones your children have at home so that dad can “play” with the kids at the same time during the video chat. Or mail a book that dad can read to the children. You may also want to request that one of the gifts in the care package be left unopened until your Father’s Day video chat. He can open it while you are on the chat and you’ll all enjoy the moment of his surprise together. It can be a good idea to forewarn younger children that technology and connections can sometimes not work as planned. Letting them know about potential technical communication glitches can help ease their fears and concerns if you get disconnected during the chat. Being so far apart from each other is difficult, especially during holidays such as Father’s Day. But these ideas can help you express your love and gratitude to the military dad in your life and strengthen your family bond no matter the distance between you.